1. 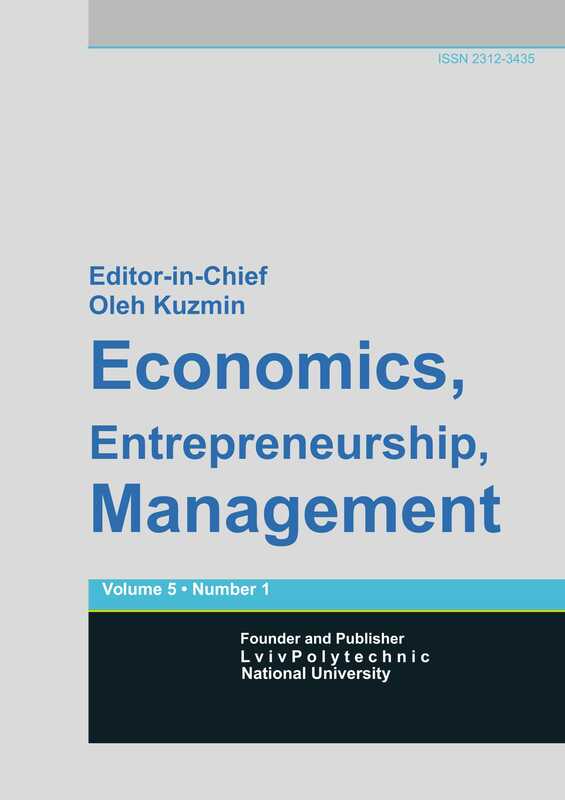 The article should be structured in accordance with «Requirements to articles, which are submitted to the «Economics, Entrepreneuship, Management». 2. Articles that are written in English . Note for Ukrainian authors. Inclusion of an expert conclusion (the original of the review of the leading experts of subject area knowledge) and Ukrainian version of manuscript of the article is obligatory. A scanned copy of the recommendations of the reviewer signed and sealed, should be sent by e-mail magazine, in addition to the file of the article. 5. The author gets 1 (one) author’s copy of the journal (1 copy of the journal for 1 article). Additional copies of the journal could be purchased from the Publisher by preliminary order (specify in the end of the article or send the order by e-mail). 6. The Editorial Board preserves the right to carry out editorial proof-reading of the article. 7. Editorial staff condemns signs of plagiarism in articles as violation of intellectual property rights and scientific ethics. 8. Articles are published on the first-served basis based on the date of receit of the article by the editorial staff. Articles are admitted to the general queue only after receipt of confirmation of payment for the publication. The paid-up articles are assigned to the nearest issues. 10. Printing of the journal is carried 20 May and 18 November each year. 1.1. Articles that are written in English and that have not been published and have not been submitted for publication to other editions (including electronic ones) are accepted for publication. 1.2. Articles in English are translated from Ukrainian or Russian language should be accompanied by the text in the original language, designed according to these requirements. Such items previously held in the editorial quality control of translation. In the case of inappropriate language as paper returns. 1.3. The manuscript is submitted to the magazine on paper and in electronic form on an electronic storage device (disk, flash drive). The electronic version of the article should fully match with the paper version. The manuscript must be signed by all the co-authors or a responsible representative. The article shall be signed by author (or authors). - information about author(s) (academic degree, academic status, position, place of employment or study, city, electronic mail address (published), telephones (are not published anywhere)). Metadata are published in the journal, relevant review editions, on the website of the journal and are stored in domestic and foreign databases. 3.1. List of references shall be drawn up under one of the most widespread international standards АРА (Americfn Psychological Association (APA) Style). .
3.1.1.Information about international standard APA (American Psychological Association (APA) Style) is available at NBUV’s website: http://nbuv.gov.ua/node/929. IMPORTANT: in descriptive elements only straight quotes (") are allowed to be used and Latin letters are prohibited to be replaced with Cyrillic ones. 4.1. Articles are accepted only in the form of files (text – in .doc, .docx, .rtf, .odt formats; charts, drawings – in any graphical format for Windows). To create formulas, tables and charts, special functions of the Word for Windows should be used. Below, the publication’s title in capitals should be placed (Times New Roman 14 pt., font bold, in the center alignment). Below the article’s title a summary should be written in the article’s language within 150–250 words (not less than 12–15 lines) and key words- Times New Roman 11 pt.,font bold. A manuscript should contain such necessary elements as the problem statement, the topicality, the review of last scientific progress and publications, the purpose and problem of research, the exposition of basic matter and finding of research, the conclusion, and the prospective of further research in this field, References.Attention! Sections article - Times New Roman 11 pt., font bold, in the center alignment). 4.4.All graphic materials (figures, illustrations, schemes, charts, etc.) should be clear and expressive; the lines in charts and diagrams as well as all symbols should be clear. The title of a figure should be placed below (in the center alignment). The word «Fig. __» and while the title of the figure should be given in italics. Below the title, a source should be given. Tables should be compact and provided with a title, while their headlines should respond to the contents, with no empty cells. The word «Table ___» should be placed with right alignment, in italics. In the next line, the title of a table should be placed in bold standard font (as well as headlines). Source of information should be specified below a table. It is not recommended to place materials illustrated (Fig., Tables, Сharts) on the page before and after the conclusion of the article. 5.2. Absence of contact information. 5.3. Absence or incompleteness of postal address (only for authors that live outside Kharkiv). 5.4. Absence of a review (recommendation, assignment, reference) of the scientific adviser, certified with a signature and seal (only for authors that have no academic degree). 5.6. Absence of the list of references. 5.7. The article was already published in another edition (including electronic editions and Internet).